He stood off to the side of the parallel giant slalom course at Phoenix Snow Park in Pyeongchang, South Korea, after one of the last events of the 2018 Winter Olympics, happy, smiling wide, but out of the spotlight. Then the spotlight came to him, Ester Ledecka — the best athlete in Pyeongchang, reporters later debated? — ran to Reiter, two snowboarders both trained in Steamboat Springs. 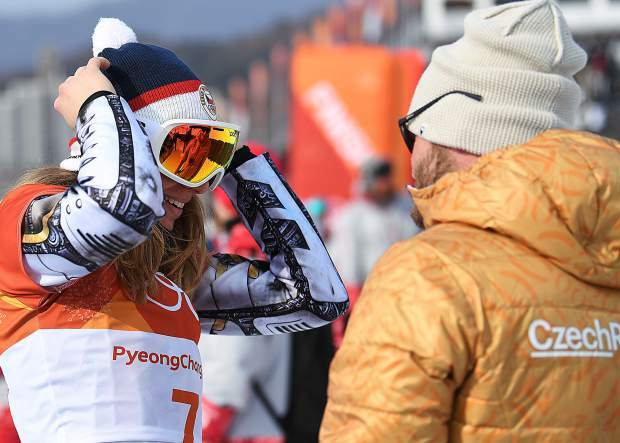 Reiter, a 2014 Winter Olympian, retired from snowboarding last summer in part for the chance to coach Ledecka, and Saturday, Feb. 24, he watched her ride to one of the great sporting achievements of the Pyeongchang Games. There’s no real parallel to be drawn. She’s simply Ester Ledecka, successful enough to accomplish something so truly unique, yet humble enough to shrink at the suggestion she may be the most talented athlete of these Olympics. “She carves the board a lot more than any other woman,” said Mike Trapp, another Steamboat-connected rider who competed Saturday and who trains with Reiter and Ledecka. Reiter teamed up with Ledecka, Trapp and Robby Burns to make a foursome. When a medical condition forced the unexpected resignation of their coach Erich Pramsohler last summer, however, Reiter saw an opportunity.